It's a friendly little cookie, no? I have a feeling if Christina Tosi ever knew what I do with her recipes, she might wanna punch me in the neck. My gluten-free Carrot Cake Truffles and Apple Pie Layer Cake from the last two swaps were, yes, divinity. But in my allergy-friendly adaptations for this lovely group of swappers, I went one step further with this swap, and tried to swap certain ingredients with their slightly healthier cousins. Because while I think Tosi is a dessert genius, there are just some things I can’t use: milk powder and liquid glucose being two of them. I gave in a little and swaped agave for the glucose. And I just omitted the milk powder and did a little dance of prayer in my kitchen, hoping they’d come out (it was a cross between how silly I look chanting kirtan and a rain dance I made up when I was little and wanted to be Pocahontas – no joke). I love her book, and really admire her recipe writing style. So I hope neck-punching isn’t in my future. These cookies are exactly what Tosi intended them to be – the best confetti birthday cake in cookie form. It truly tastes like the vanilla Betty Crocker cake mix I remember from days of yore, rolled up in a snicker-doodle-esqe base with a touch more salt. They’re incredible. The Birthday Cake Crumb adds that extra touch of awesomeness, and the design is just fun! Now head over to Cassie’s Bake Your Day for the original recipe and go say hi to the Milk Bar Ladies! Meet the Milk Bar Ladies! Combine butter, sugar and agave in bowl of stand mixer with the paddle attachment. Paddle for 2-3 minutes on medium/high. Scrape the side of the bowl, add the eggs and vanilla, and paddle on medium/high for 7 – 8 minutes, when the mixture is incredibly pale, light and fluffy and has doubled in size. Reduce the mixer to low and add in the flour / sprinkle mixture. Mix until it just comes together, less than one minute. Do not over mix. 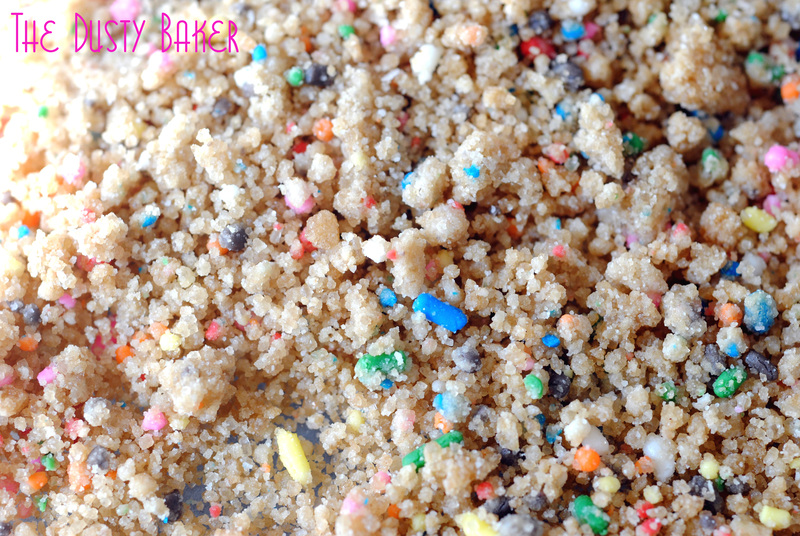 On low speed, stir in the Birthday Cake Crumb, just until it’s incorporated. Scoop onto parchment or Silpat lined sheets – I made 12 large cookies by doubling my cookie scoop, then another 12 small cookies by single-scooping. Either way, make sure there’s a good 3-4 inches between each on the sheet, and press down with your fingers to flatten (this version will not spread that much). Refrigerate for at least one hour or up to 1 week before baking – do not bake directly, these must be chilled! When ready to bake, preheat oven to 350°. Bake large cookies for 18 minutes and small ones for 14 minutes, or until the edges are brown and the centers are just starting to show color. Cool completely on sheets before removing to plate or container. Can be kept at room temp for 5 days or frozen for 1 month. Once again this whole crumb thing blew me away. It adds a bit more texture and salt to the recipe, and a lot more flavor. These crumbs are a tad more healthful than the original, but are addictive nonetheless. Use your fingers to press the crumb into little clusters if paddling doesn’t do it. Oh, and I grabbed my bin of “dog-knows” gluten-free flour, where I’ve basically thrown whatever cookie flour I have leftover from a recipe into the bin. I used that for the 90g below, but a fair estimate is that it’s 1/3 starch, 1/3 brown rice and 1/3 white rice flour with 1/4 tsp xanthan gum. Heat oven to 350°. Line a baking sheet with silpat or parchment. Combine the top ingredients in mixer with paddle attachment and paddle until completely combined. Add wet ingredients and paddle again until clusters appear. When all the moisture is absorbed, use your fingers if necessary. Spread the clusters on the sheet and bake for 20 minutes, tossing half-way through.